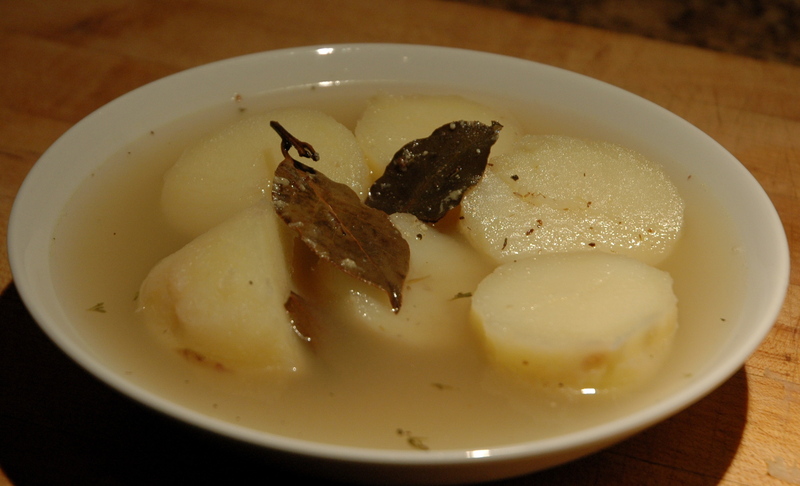 Scrub potatoes and submerge them in a small pot with the chicken broth, bay leaf & thyme. Bring to a simmer and cook, uncovered for 22-28 minutes, turning occasionally, and testing with a thin knife for doneness. Knife should slide all the way through evenly without meeting pockets of resistance (this is not political, it’s just potatoes). When finished cooking, remove potatoes to cutting board to cool. Reserve the herbed broth. As soon as handleable, peel the potatoes and discard the skin. Slice each potato in half and place in a bowl. Cover with broth and place on counter to cool entirely. To finish, heat a few tablespoons of flavorful oil in a skillet to 300-350 degrees F. (about 1/4″ of oil should cover the pan). 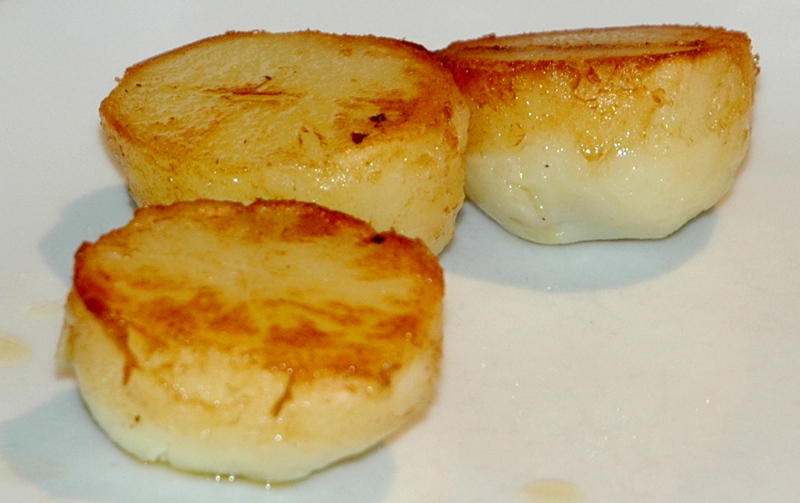 Any fat saved from roasting or frying meat will do nicely. Pat each potato dry with a paper towel (or they will splatter terribly). Place each potato cut side down into the oil for approximately 2-3 minutes. Fry the cut side only. Remove to serving plates and pass the salt and pepper. Potatoes cooling in herbed broth. It surprises my mother that I grew up to love potatoes. In my childhood, I was extremely, to the max, ridiculously finicky. Potatoes were only one of the long list of foods that got my gag reflex going. My poor mommy had four picky kids to feed on a very modest budget, and I was the responsible, people-pleasing oldest one of the bunch. My empathy for the cook who worked to put a meal on the table (my poor mommy!) was stronger than my revulsion. I hated almost any cooked vegetable. Tomatoes–fresh, canned or in Campbell’s soup gave me the willies. Rice was not nice. Cheese–just the word itself, cheese, made me cringe. For years, I lived on Captain Crunch, Campbell’s Chicken & Stars soup, fruit (my grandma’s homemade canned pears were my favorite, but any fruit, fresh or canned, was fine with me), hamburger, Schweigert brand Thuringer lunch meat, Wonder bread toasted and spread with honey, pimento-stuffed green olives and iceberg lettuce with Richelieu Western Salad Dressing. Then I turned 9 and we visited my aunt in Wisconsin. My mom couldn’t believe it. I ate. Everything. Auntie M. served spaghetti with marinara sauce (I had never tasted anything so exotic!) and I gobbled up three helpings. I begged for another serving of her wild rice casserole with mushrooms. More broccoli with cheese sauce, please! I even ate the potatoes. When a good cook meets an appreciative eater, table-magic happens. That weekend changed my life. But what happened, exactly? How and why did I transform from a picky eater to an avid foodie? I’ve been thinking about this for weeks–and I can’t explain it. Can you? Do you have a powerful food experience that changed the way you feel about food? I was such a picky eater growing up on a modest budget, as well! I’m still a pretty basic meat and potatoes, bland Midwestern eater, so I haven’t yet had my food epiphany…but I’ll keep you posted! Oh, and your potatoes look delicious! Most of the people I know are meat-and-potatoes eaters. As much as I like all kinds of ethnic foods, my comfort foods are all Midwestern. I KNOW this recipe! I have made it. It is super delicious!! That reminds me–I need to send you the Jaegerschnitzel sauce recipe…. Probably will have to wait until next month. I’m surrounded by boxes and can’t find anything, and have to set up the kitchen, my office, organize the closet… Moving is such fun! When my son was little, all he liked was hot dogs and peanut butter. We could not convince him to eat hamburgers, until one weekend when he was sleeping over at a friend’s house and his friend’s mom made homemade hamburgers. Out of politeness he tried them and discovered a new favorite! That’s interesting–I think politeness had a lot to do with most of my new food discoveries, too. I was too embarrassed to tell the hosts that I didn’t want to eat the food they put in front of me.